VIDEO: President Duterte declares martial law in Mindanao - Balita Boss! President Rodrigo Duterte has declared martial law in the whole island of Mindanao following the attack by Maute militants on Marawi City on Tuesday, May 23, 2017. 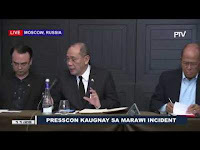 Presidential spokesperson Ernesto Abella made the announcement during a briefing in Moscow, Russia as ordered by the Duterte. "As of 10 PM Manila time, he has already declared martial law for the entire island of Mindanao," Abella said. Martial law will be implemented in Mindanao for 60 days. Duterte is in Russia to meet with Russian President Vladimir Putin and Prime Minister Medvedev as part of his official visit. With the situation in Marawi, Foreign Affairs Secretary Alan Peter Cayetano revealed that Duterte has decided to cut his Russia trip in order to return to the Philippines. The Presidential Communications Operations Office said the President will leave Russia at 5 am on Wednesday, May 24, Manila time. He is expected to arrive in Manila at 5 pm on Wednesday.